Today we’re thrilled to host a giveaway for the incomparable Patrick Ness! Ness is the author of the multiple award winning Chaos Walking trilogy, as well as YA science fiction dystopia novel More Than This. Thea adored The Knife of Never Letting Go, The Ask and the Answer, and Monsters of Men, and Ana was a huge fan of More Than This – naturally, we want to spread the love for these books as far and as wide as possible! Thus, to celebrate the paperback release of these four books, we are giving away a full set to one lucky winner! Patrick Ness is an American writer, journalist, and lecturer. Currently, he lives in London. His writings for adults include The Crash of Hennington, Topics about Which I Know Nothing, and The Crane Wife. His writings for children include The Chaos Walking trilogy: The Knife of Never Letting Go, The Ask and the Answer, and Monsters of Men, and A Monster Calls (from an idea by Siobhan Dowd). A Monster Calls has won the 2012 Carnegie Medal and its sister prize for illustration. 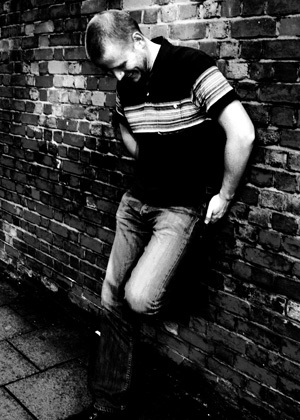 Follow Patrick on his official website, on twitter (@Patrick_Ness), and on facebook. We’ve got one set of the Chaos Walking books (The Knife of Never Letting Go, The Ask and the Answer, Monsters of Men) and More Than This up for grabs! The sweepstakes is open to addresses in the US and Canada and will run until Sunday August 3 at 12:01am (EST). To enter, use the form below! Good luck! I haven’t read any of Patrick Ness’ work yet but I really hope to soon! I’d love to win this giveaway, the paperbacks are gorgeous! Oh but I just got so excited I forgot to answer the Rafflecopter question – my favorite dystopian book is Divergent but for a series overall, the Legend trilogy by Marie Lu is flawless. Plus I really liked The Young World by Chris Weitz. I love Patrick Ness! Every single thing he’s written! This is probably a rather cliche answer, but The Hunger Games is my favorite dystopian novel/series and actually one of my favorite series in all categories. It also got me started on reading YA. 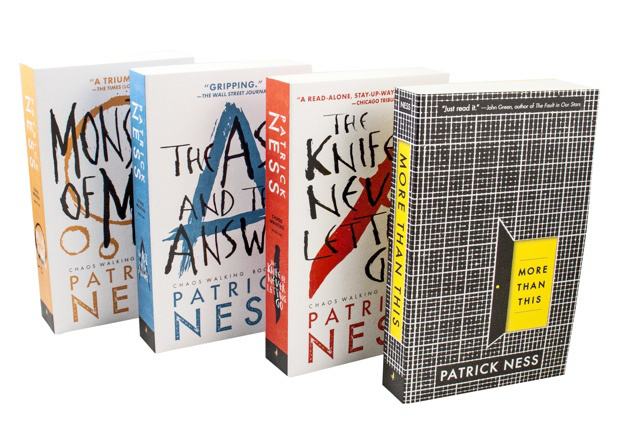 I have never read anything by Patrick Ness, but these books sound quite interesting and I would love a chance to win them! Thanks! My favorite is that oldie but goodie, The Giver. A lot of recent dystopian fiction has really disappointed me with its excessive focus on romance and angst, unfortunately, and I always return to Lois Lowry’s masterpiece for an model of world-building, characterization, and moral conundrums. I haven’t read Patrick Ness’s Chaos Walking series yet, but I recently loved his amazing The Monster Calls (I cried three times). I would love to have a set of these for my school library. Yikes! I commented before I read the instructions. Right now, my favorite is Divergent, but that can change at any time. I have loved the Cinder series and recently started Divergent and been loving that too. The Chaos Walking trilogy, obviously. Ummmmmm–Lord of the Flies, and the Giver. Divergent and for middle grade (fantasy) The Unwanteds. I’ve never read an ending of a dystopian series that I have actually liked so I tend to stay clear of dystopian, but I’ve heard good things about this series so maybe it will be my favorite dystopian. This is SUCH a good trilogy. But then again, I’ve read them all, LOVED them all, and own a copy of More Than This! So I’m possibly not the person who needs persuading that Ness is the most awesome YA author ever! My favorite YA dystopian is probably whatever the last one I finished and really enjoyed which in this case is The Young World by Chris Weitz. This trilogy is actually my favorite. I’d love to read More Than This! I’m not a big reader of dystopian, but Chaos Walking is on my to read list. This has been on my TBR list forever. I look forward to reading it. My favorite would have to be my first dystopian novel, The Giver! The Chaos Walking trilogy is my definite fav! I haven’t read any dystopians lately. Thanks for the giveaway. My favourite YA dystopia is probably The Hunger Games, but I also adore the Chaos Walking trilogy. Hunger Games is the first that comes to mind, Divergent is on my list of “to reads”. Now Patrick Ness’ books are going on my Goodreads shelf also! My favorite dystopian novels (because I can’t choose just one) are The Giver, Lord of the Flies, and The Handmaid’s Tale. Favorite YA dystopian novel? Such a hard one! I might have to go with The Giver, which had the one of the largest impacts on my childhood. I’m a huge fan of the heartbreaking realism of Shipbreaker as well. It’s hard to pick my favorite YA dytopian of all time — I’d have to go back and reread the ones I loved in high school… But my favorite of the recent crop is probably still the Hunger Games. Not necessarily my favorite, but I really liked In the After. I haven’t read the sequel yet though. This is pretty awesome. Patrick Ness is my favorite author. Favorite dystopian would easily be Chaos Walking (…well, possibly More Than This), though in the interest of getting more book recommendations out there Fahrenheit 451 is very poetic and poignant, especially (but of course not only) for book-lovers. Favorites are hard to choose, but The Giver will always be at the top of the list. I still have to read the last book but I absolutely love Ashes and Shadows by Ilsa J. Bick! This is a tricky question but I think my favorite dystopian YA novel is Ship Breaker. Ness is high on my list of authors I want to read. I love the Hunger Games and Poison Princess (by Kresley Coles). This would be a great contest to win! Thanks! I have to agree with many other commenters and say my all-time favorite dystopian is The Giver. Actually, Ness’s Chaos Walking is a favorite of mine already. But I also really enjoy Scott Westerfeld’s Uglies series. Thanks for the great giveaway! The Cinder series and the Hunger Games have been my favorite. I haven’t read TOO many YA dystopian novels but some of my favorites include The Hunger Games and Enclave by Ann Aguirre. Thank you again for this fantastic giveaway! There are so many to choose from, but I’d say The Giver. I don’t think I read any YA dystopian novel other than the Hunger Games (or maybe I just don’t remember. It’s not my favorite genre). I enjoy reading YA novels. I have really enjoyed the Divergent Series by Veronica Roth and Hunger Games by Suzanne Collins. I would love to read a new series since I am between books right now. Hate dystopian. The recent offerings are just way to cliche for my taste. The closest I’ve liked something was the Incarnate series. OMG!! I Love these books. Patrick Ness is one of the few authors that start me fan-girling!! Under the Never Sky is probably my favorite dystopia. I wasn’t expecting it, but it really won me over. The Chaos Walking trilogy is actually in my all time favourites – I’d love to own copies. The new ones are so pretty! The Legend series by Marie Lu is pretty great, and I loved All Our Yesterdays by Cristin Terrill as well. I think my favorite YA dystopia is actually the Chaos Walking series!! Have to go with The Giver — it blew my mind the first time I read it in middle school, and has stuck with me ever since. Individual book, definitely The Giver. Series, probably the Uglies. Can’t wait to try these books! Too question…recently read a pretty good one called Paradigm by Ceri Lowe. But from what my good friend keeps telling me, this one is going to take over as a favorite IMMEDIATELY. I love the Chaos Walking trilogy! Definitely my favorite dystopian series. I really loved Monica Hughes as a kid, and I think Devil on My Back was my very favourite. These books have always had such an interesting plot! My favorite dystopian series would have to be the Shatter Me series! I have a feeling these books will be one of my favorites as well! Hmm, Chaos Walking, Hunger Games, Smoke & Bone: all three are anti-war dystopian, so I’m going to have to mention all three as my faves. Young people decreasing conflict is apparently my jam. I gotta go with The Hunger Games on this one. Thanks for the amazing giveaway! The Giver has always been my favorite dystopia. But I enjoyed the Chaos Walking trilogy immensely! The Hunger Games trilogy is my favorite. The Giver was previously my favorite. My favorite dystopian is probably Divergent, Legend, or The Darkest Minds. The Hunger Games, Divergent, the Razorland Trilogy by Ann Aguire, and the uglies! Favorite dystopian… hmmmm… Is it too lame to go with the classic Hunger Games answer? Because those were great. I’d also say the Never Sky trilogy as well, though I’m not sure if that’s really dystopian or just sci-fi/post-apoc. Been DYING to read these books. Heard such amazing things. My favorite dystopian is probably Unwind by Neal Shusterman. I REALLY loved The Fifth Wave. There are many others, but I can’t think of them right now. I did love the Chaos Walking books quite a lot and More Than This was also wonderful. Beyond those I really like Blood Red Road, but haven’t read the rest in that series. I liked The Fifth Wave quite a bit; it was something different than a lot of the other recent dystopians I’ve read. My favorite dystopian series would be the Hunger Games series. Thanks so much for hosting this giveaway! I’m really excited to give Ness’ books a try. As for your question, I’m going to be really boring and predictable and say The Hunger Games. I still think that YA dystopians published use it as a means of comparison, and for good reason. It reinvigorated familiarity of the genre and it just a well-done series in its own right. My favorite YA dystopia would probably be Partials by Dan Wells. I just really enjoyed that trilogy a lot. I have been wanting to pick up Ness’s The Knife of Never Letting Go for a really long time, so I would love to have the whole trilogy! Well besides The Hunger Games…. probably Susan Ee’s Penryn & The End of the Days series, with Angelfall and World After currently out right now. Of course I’m a huge fan of The Hunger Games and Divergent but I also love The Darkest Minds by Alexandra Bracken and Legend by Marie Lu. I really liked Divergent! Thanks so much for the giveaway! What an awesome giveaway! I’d love to win these books, being a bit of a late comer to Patrick Ness. I have read a Chaos Walking short story, and A Monster Calls… wow, that man is a talented and powerful writer! ???????? Oh and those question marks ^^ were emojis! (Not doubting the talent of Mr Ness!) Whoops! And in answer to the question, my fave dystopian novel is ‘Oryx and Crake’ by Margaret Atwood. I have to go with The Giver. It’s such a classic! Q- What’s your favorite YA dystopian novel? A- I haven’t read many YA dystopian, but so far The hunger games is number one ! The Hunger Games and Chaos Walking! I’m a huge fan of Patrick Ness.